Yesterday, I had occasion to go to a radio station (a large, reputable and pretty popular one) where I recorded a voice-over for a commercial for my school. When I got there, I was shown around by a nice fellow (who assumed, incorrectly, that I wanted to spend time learning about their station as opposed to getting the job done and beginning the thirty-minute trek through construction-impeded traffic back to my school). What I was most impressed with was how unimpressive the place was. I had expected something more, I don't know, sparkly, I suppose. I mean, this was a big radio station. "The Spirit of Radio" and all that . . .
As we walked through the building to the studio I was to record in, my guide pointed out various locally famous personalities in sundry teensy rooms. And do you know what the rooms were? They were offices with sound equipment in them. 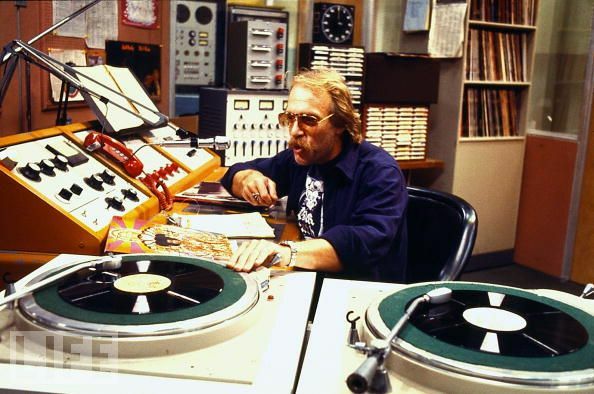 Maybe I am buying into a cliche, but I always thought disc jockeys and radio personalities were the types who wanted to live life on their own terms -- free spirits, who shunned the 9-5 office grind for something more . . . sparkly. Something more raucous and rebellious. But there they were in a tired, and architecturally uninspired building with stained carpets, cramped into smalls rooms, penned in by their broadcasting equipment, throwing their voices out to the world; trapped at work, but spinning their voices out into the air. It all seems like such a damn good metaphor about dreams and realization. Anyway, doing the voice-over was fun; though, now I know I will have to live with the constant ribbings from my co-workers and students as the spot plays over the next few weeks. I suppose that's the price of fame [puts on shades].